2018 was a stable and good year overall! In 2017 I wasn’t quite sure how my life was going to develop, if I would ever play guitar again, if I would ever eat a normal meal again, etc; so I’m happy that I’ve been getting back to work after suffering an incredible set-back due to health problems that were triggered by a parasite that I caught in November 2016; the following year I suffered from both post-infectious syndrome in addition to a shoulder injury, so you can imagine my relief that I’m both back to playing and exercising again in addition to recording. The truth is that I’ve been incredibly ill and now find myself immensely grateful for every single little thing that is positive in my life. The timing of my illness couldn’t have been worse; it would have been preferable if everything had just kept on moving forward, but I guess that life isn’t inclined to operate like that. 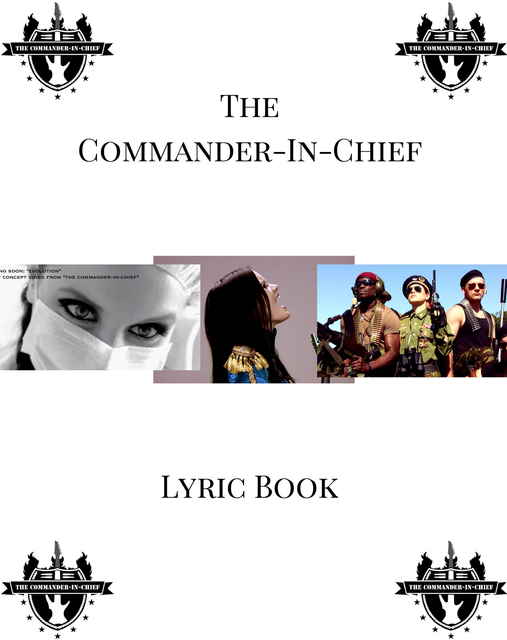 2017 is the only year where no music was released from me at all since starting the whole “Commander In Chief” business with Elisabeth back in 2008, I did release an illustrated Lyric Book however (that charted), in addition to writing a lot on this blog. Getting back to work and actually being able to play again. After losing over a year of my life to health issue this is undoubtedly this year’s highlight. It has been an uphill struggle getting back to work again but I’m very happy that I’m better. I started off 2018 working because I knew that I had to bring music back into my life again even if it meant just working for some minutes or some hours every day. I experienced set backs and sometimes struggled with motivation. I found it saddening that my energy was so greatly reduced. The skin on my fingers also had to get used to playing again. Starting a Patreon page. We’ve done two successful crowdfunding campaigns in the past through Pledge Music and finally signed up to the subscription model this year. This is obviously the best was to support talent as the aim is to create a monthly salary for artistic individuals. There have been many start-ups and trends aimed at the ever-changing music industry in the aftermath of the digital tech-revolution; the Patreon model seems really cool to me. Needless to say: this is the best way to support me as an artist! 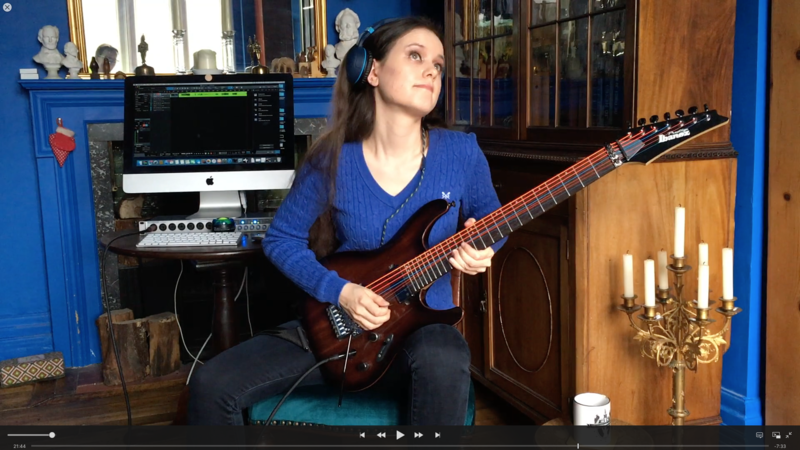 Every month this year, since I started the page, I’ve released 2 video updates and offered album previews and downloads to my Patrons. I also created a 30 min. 10$ guitar lesson, in addition I’ve also sent out care-packages with exclusive content. Make sure that you sign up if you like my work! Finally releasing my 3rd album! I buzzed about it & teased about it; in November 2018 I finally released “Berit-Vol.1.“ In my opinion it is the best music that I’ve written so far. The first music industry person to review it has called it “a masterpiece.“ I’m very proud of my 3rd album which I’ve co-produced with my manager/vocal coach/promoter/mother Elisabeth. I look forward to pushing it extensively in 2019. So far we’ve sent out signed physical CDs to 19 different countries! 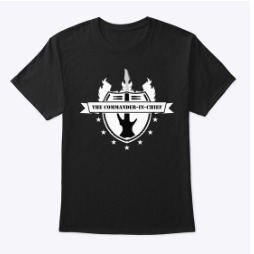 We did a successful independent pre-order campaign despite not having optimal reach on Facebook (and other social media websites) and without any major press outlets covering the release. We had to order another batch of CDs which is always good news and what you want as an artist, especially as an unsigned, independent one. I’m very excited about the feedback that I’ve received and once again find myself in the situation of having created something that people are willing to pay for! My hope for 2019 is that we’ll be able to get a marketing budget for my album, so that more people all around the world can get to hear my music! So far we’ve released 4 music videos for it and a teaser video, we’ve also done live streams on YouTube to promote it as well. More music videos will be shot when the new year kicks in. I can’t wait! I passed 3 million views on my YouTube channel! If this had happened a couple of years ago I would have marked it with great fanfare, I just posted a little post on my Instagram page, but I was very, very, very, happy still! I’ll drink some extra champagne on New Years and celebrate retroactively. The release of the rehearsal tapes from 2016. Since things did not play out the way that I had expected regarding the major label that I worked with in 2016 on my “secret project” it made me very happy that we actually had lots of videos from that period. Hopefully I’ll complete what I started in 2016 in 2019. The making of the physical version of my “Lyric Book.” Nothing beats having a physical copy of something you’ve created in your hands. It made me very happy to hold the very first physical copy of my Lyric book. I think it looks very exclusive and nice. I’m very proud of it. I had my music aired on a major Norwegian Radio Show. This was the first time that several of my recordings and the scope of my talents actually received Nationwide attention by a major broadcaster in my home country . My cover version of “Paranoid” was aired once in either 2011 or 2012 by a Metal show, but this year I actually did an interview and had both my metal and classical work covered, which I’m very grateful for. Getting on the digital front cover of Classical & Crossover Magazine. It has been a quiet year in terms of press with only one outlet mentioning the release of my Toccata video, and only two mentioning my return to music and the release of my first single and video from my upcoming album. So far since the release of my album last month I’ve done one interview and received one review of it. It made me very happy and grateful to see that I landed on this front page this year, it was also funny to get yet another reminder of how small the industry actually is. My debut as a classical singer. While I’ve been working on Heavy Metal and classical crossover virtuoso guitar playing I’ve also been studying bel canto opera singing; I’m actually a coloratura soprano. This year I finally showcased this during a benefit concert that I did in order to raise money for the crumbling churches of England. It was an enormous luxury to be able to just show up to rehearsals with only a bag containing sheet-music and drinking water. I would absolutely love to do more concerts and hopefully also recordings as a classical singer. It makes my life way more easier than dragging my guitar around. Also when I sing classical I keep myself to music that has been written for my voice type, rather than doing all sorts of crazy stunts like I’ve done on my guitar and in my original music, where I’ve consistently picked pieces not written for my instrument or written extremely high notes and vocal runs combined with equally challenging guitar playing. Singing traditional classical music is certainly not a suicide mission and I enjoy it tremendously. Being in the Norwegian Grammy jury once again. My involvement with the Norwegian Grammys this time around started in the fall of 2017, I was still not quite there in terms of my health and managed to miss out on some phone conferences, but managed to listen through all of the material handing in my points. If I had had the energy then maybe I would have broken my back trying to get to the show in order to walk the red carpet and get some press, rather I chose to lay in bed. “2 Guitars: The Classical Crossover Album.” The album I recorded with Craig Ogden and released in December 2014 has continued to haunt the Amazon bestseller chart! This makes me extremely happy and proud! It is a great concept indeed and something that I’m aiming to get back to next year since I want to release a second album in the spirit of what I was working on before I got ill. The fact that this album keeps on selling on its own account makes me so happy that I don’t have words. It makes me incredibly happy to feel valued as a musician and that all of my efforts are taken seriously! Getting a piano again. We finally got back a proper piano in the house this year, which made me really happy. I’ve written so many instrumental songs for piano and now I can finally revisit those and compile an album with this sort of material as well. The release of my 3rd book. In March this year I released a blog book featuring entries from my first two years of blogging. The book has not been successful, I don’t know if this was due to all of the pages that were made available for a preview or if people just don’t care too much. Considering that this has been my most popular blog year so far, I’m not too sure what to make of it. It is still out there though and I will eventually make the entries I’ve published between 2017 & 2018 private as well when I release book nr.2. Confirmation. Last year I read an awful lot that had to do with politics in Norway before I registered to vote for the very first time, this year I finished reading The Holy Bible in its entirety and was confirmed by the Bishop of Tewkesbury! The service was absolutely amazing and my mother cooked up an incredible feast for all of us who gathered in our living room afterwards to celebrate. It was a wonderful evening that will stay with me forever. William’s conversations. My brother & I have never been closer! I appreciate this a lot! Nicole’s Debate Club. Now I know how it feels like to be part of the cheerleading team. Nicole and her partner were one of the three teams that won and went to the next round representing their school in a debate competition. It was great to be invited and to get insight into (once again) the best of England. Successful Fundraising. Back in high-school in the U.S.A. I was involved-ish with issues that concerned me but I always felt that I fell short. Once I moved to London to pursue my rock-star dreams charity was certainly not on the agenda. After moaning around on my blog about issues that concerned me (from 2016 onwards) I figured that I could try to raise money for my local community by doing a fundraising event; since I know that the local church (and churches all around England) are struggling. I had no idea what would happen but managed to raise lots of money and be of genuine help by using my musical talents! I repeated the success in December 2018 by doing a Christmas concert where I was able to raise lots of money for the local Village Hall! The fact that I could pull off two successful fund-raising events in a small village in The Cotswolds really made my day since I now can say that I was of genuine help and could contribute in a noticeable fashion! This was my first go at fundraising and I can say that I pulled it off! 🙂 Thanks a lot to Rev. Colin Randall & Georgina Oldham for promoting the events. This has been my most popular year of blogging! My Skin Care Entry has become my most popular entry of all time! Lots of people are clearly searching for the various skin-care ingredients that I mentioned in this post; some of the searches are for allergic reactions! It is obvious that there is a great interest in this topic since I wrote this post back in September 2016. Self-help is a popular topic! This 2017 book review of Dominique Loreau’s “L’art de la Simplicite“ tops the list. People are clearly in need of spiritual guidance and motivational assistance. This simple summer update is my top entry of everything that I’ve written this year! There isn’t really much content in the post, but there are summer-pictures of me! A brand new addition to my site, this is my home-page which I created not that long ago when I changed my blog design. The front page is only dedicated to music so that this is the 1st that people see. Pedophilia, Cannibalism, Prostitution & Racism. Yes, that is quite the title I’ll admit! Grotesque and troubling topics that were all addressed back in December 2016. This unflattering documentary about Chinese expansionism into the African continent tops the list once again which was what I predicted once I made it public again. This was a total joke meant to troll my fans & followers. Diversity – Why it is a complex issue. I don’t know if I should feel alarmed that these type of entries are becoming increasingly popular. Trust me, I don’t like division, hate and instability; I’ve written what I’ve written since I don’t like these things, yet I think we are heading towards dark times indeed. It’s all due to bad political management. It’s totally unnecessary as well. How to fix your apple wireless keyboard! I’m glad that I can be of help! This is the 2nd mental training/self-help book to make it into my top. 10! 30 Reasons to be grateful and/or things to look for. The civilian population is ill-prepared to deal with survival. Nobody really talks about the general preparedness level, I chose to do so this year after the village that I live in lost its tap water. This is Evil. The most sinister document I’ve come across so far suggesting ways in which to artificially create a fertility crisis in the U.S.A. When You Think You Are Healthy… even eco-friendly, over-priced, politically-correct food comes wrapped in plastic. The downward spiral of curiosity & honesty, I think this sums up my blog & my writing perfectly. The greatest weapon of all = us. What is the end-game of NATO’s foreign wars? What is the end-game of political activism? When you lose your headquarter while fighting a conventional enemy. Immigration is a heated topic worldwide & nobody really respects anyone’s Sovereignty unless forced to. I hope 2019 will be a good year! Fingers crossed!